The traditional energetic materials are insufficient to sterilize the deleterious microorganisms carried by biological weapons completely. Three kinds of biocidal energetic composites were investigated herein: (1) aluminum/manganese iodate/nitrocellulose (Al/Mn(IO3)2/NC) composite microspheres prepared by electrospray, (2) Al/Mn(IO3)2/NC nanocomposites prepared by physical mixing, and (3) Al/Mn(IO3)2 nanothermites prepared by physical mixing. 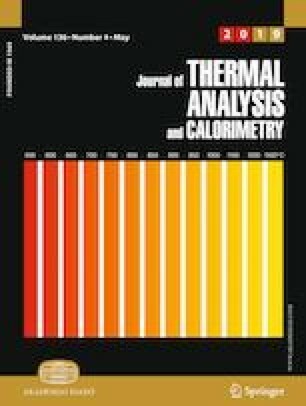 The thermal decomposition process of Mn(IO3)2 was studied by thermogravimetry–differential scanning calorimetry-mass spectrometry (TG/DSC-MS) at a low heating rate of 5 °C min−1, and T-jump/time-of-light mass spectrometry (T-jump/TOFMS) at a high heating rate of ~ 5×105 °C s−1. The ignition temperatures of three energetic composites were measured in a T-jump gas chamber (Ar, 1 atm) by a high-speed camera. The combustion performance of three energetic composites was investigated in a constant-volume combustion cell. The results show that Al/Mn(IO3)2/NC composite microspheres prepared by electrospray have a better ignition (lower ignition temperature) and combustion (higher pressurization rate and peak pressure) performances than the other two prepared composites. The thermal performances of these composite microspheres also overshadow the documented energetic composites such as Al/AgIO3, Al/KIO4, and Al/NaIO4 nanothermites. The MS results at high heating rates demonstrate the production of I2 from the thermite reaction, potentiating Al/Mn(IO3)2/NC as an energetic formulation for biocidal applications. The online version of this article ( https://doi.org/10.1007/s10973-019-08226-4) contains supplementary material, which is available to authorized users.